The house was designed by the architect Hartvig Sverdrup Echoff assigned by his uncle, who at the end of the 1800 was the head master at Stavanger Cathedral school. The school can still be found next to Stavanger Cathedral, now under the name of Kongsgård Videregående Skole. We believe the house was constructed and completed sometime between 1895 and 1900.
to his illegitimate son when he first came to Stavanger. The daughter Henny became an actress. Her career started at Stavanger Faste Scene (Rogaland theater) in 1914. Later she moved to Oslo, where she worked at “Det Norske Teater” from 1918-1957.
movie was very popular in Norway and was shown throughout the 1970 and 80’s as a traditional Christmas movie on national television. Henny is also the mother of the well known actor Espen Skjønberg. The house has a very colorful history and has been the address of many varied businesses. Among them a soft drink factory, a guest house and school of commerce. Despite the fact that the property has housed different businesses and a large number of people, the property has not had many owners. When Mrs. Eide lost her husband, she sold the property to Mrs. Walle Lie who operated a very successful guest house at the property until 1941, when it was sold to Magne Eriksen . There are uncertainties around the circumstances of the sale to Magne Eriksen. We do know that the Stavanger council was requested by the German occupying forces to take possession of the property. just became impossible for her to sustain an income from the guesthouse after the takeover. However, we know it was a difficult time for her. According to her grandchildren, it was something she did not like to talk about it. When Magne Eriksen bought Oscarsgaten 18, he already was the owner of a clothes manufacturing business and several rental properties in Stavanger. He was not a popular landlord and was taken to court by unhappy tenants on more than one occasion. Under his ownership the property fell into decay. In 1973 it had deteriorated to such an extent that the council wanted to demolished it for safety reasons. Luckily, the motion was dismissed and the house was sold to Berit Dahl who slowly, but surely, started to renovate the property. 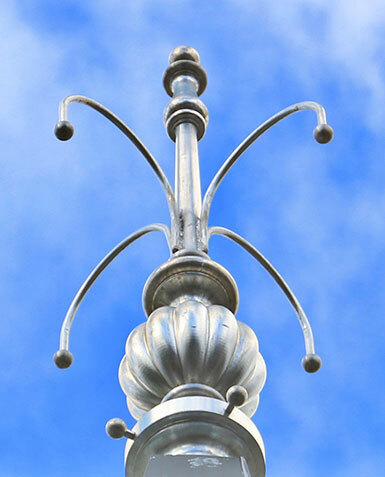 We bought the property, January 2011 and has since then finished the restoration work started by previous owners. Today we are proud of what has been accomplished and delighted to re-open Oscarsgate 18 as a guesthouse. 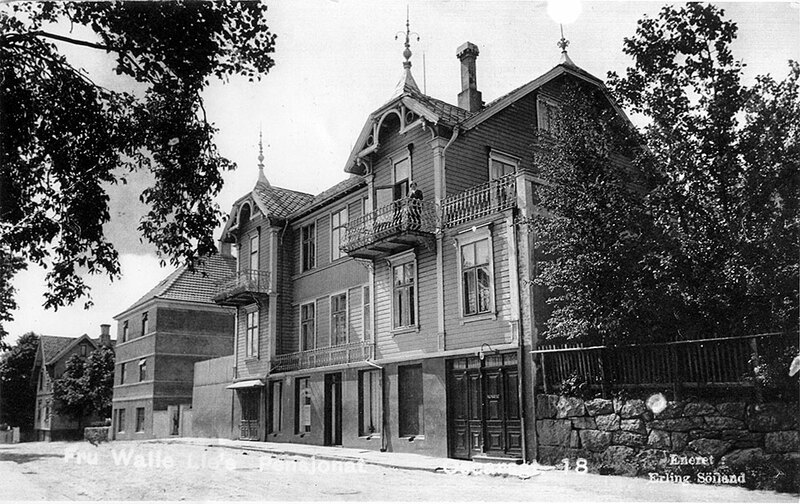 The house was designed by architect Hartvig Sverdrup Eckhoff (1855-1928). He was educated at the Technical University of Munich and opened his office in Stavanger in 1883. Oscarsgaten 18 was built at the end of 1800 for his uncle, who, at that time, was headmaster at Stavanger Cathedral School. The school is still in operation, and you will be able to see it next to Stavanger Domkirke. Eckhoff joined the school in 1881 and, for the next 30 years taught drawing and art there. Read more about the architect here. Stavanger had been a prosperous and wealthy town during the 1870’s, and Eckhoff, together with fellow architects were given many prestigious public assignments. Eckhoff designed Stavanger Gymnastic Hall in 1891, Stavanger Theatre in 1883 and Stavanger Hospital in 1897. All these buildings are characterized by Historicism and Neo Renaissance. He designed Stavanger Museum in 1893, unfortunately this was never completed as Stavanger experienced a terrible financial and economic crack, and as a consequence, the building work came to a halt. Stavanger as a town, did not recover from this economical down turn until after World War 2. As a consequence of the economical down turn, only a small part of the museum still stands as designed by Eckhoff. The building was not completed until 1930, which was after Eckhoff’s death. Before completion the mid section of the museum (originally designed by Eckhoff) was completely changed and unfortunately the new extension was designed in a totally different style. 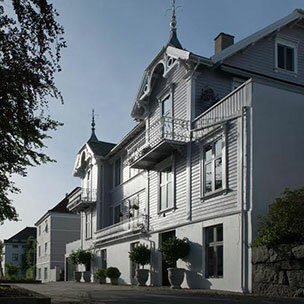 Hartvig Sverdrup Eckhoff did design some private houses as well, among them Eiganesveien 28 in 1881, Villa Wrange in Haugesund, and of course, Oscars gate 18. He was commissioned to build a villa for author Alexander Kielland at Malde in 1882, but this never materialized because of the economic downturn.